The National Guard Family Program of Massachusetts Mission statement: To establish and facilitate ongoing communication, involvement, support, and recognition between Guard Families and the Guard in a partnership that promotes the best in both. The Family Program Office is available to meet your needs and those of your family. There isn’t a problem, situation, or concern that cannot be addressed by this office. You are promised complete confidentiality and professional service in a timely manner. Monday through Friday - 7 a.m. to 5 p.m. 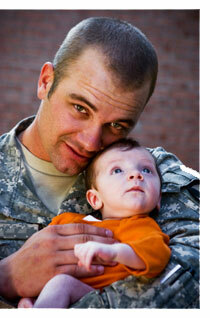 The Family Program strengthens the partnership between the Guard and Guard Families. Involvement in the Family Program is an excellent way to educate families. Our program depends on volunteers. Youth participation is vital in achieving our Family Readiness Goal. The Family Program keeps Families informed. The Guard’s Family Program notifies Family members about various benefits, entitlements and special services available to Guard members and their Families during times of deployment and non-deployment. The Cape Cod Spouses Club ’s mission is to support the morale and well being of service personnel and their families through charitable and social activities in a friendly atmosphere. More information is available by emailing thespousesclub@gmail.com. "FRESH Markets" are held on Wednesdays from 3:00 to 5:00pm at the JBCC in the Dining Facility, Building #1200, at the intersection of West Inner and South Inner Roads. 2018 Schedule: September 5th, 26th, October 10th, 24th, November 7th and December 12th. 2019 Schedule: January 16th, January 30th, February 13th, February 27th, March 13th, March 27th, April 10th, April 24th, May 8th, May 22nd, June 12th, July 10th and August 14th. Cooking Demonstrations Free Samples, Children's Activities, Nutrition Education. Everyone will receive the featured recipe and food items to create the meal at home. A bag of fruits and vegetables will also be provided.